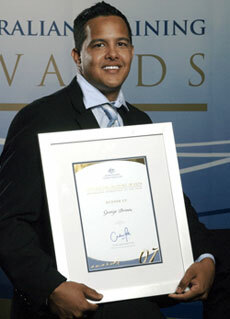 Charles Darwin University student George Brown was runner up Australian Apprentice of the Year at the recent National Training Awards held in Tasmania. George completed his certificate III in Automotive (mechanical – heavy vehicle/plant/earthmoving/agriculture) at CDU while completing a heavy diesel mechanic apprenticeship with employer Hastings Deering in Darwin. The Australian Training Awards are the peak national awards for vocational education and training, recognising innovation and excellence in the training sector. State and Territory award winners competed in the national finals. George won the NT Training Awards after being nominated by his employer, Hastings Deering, for his excellence and commitment to work during his apprenticeship which he completed in 2006. He then travelled to Tasmania to compete in the national finals, spending a week participating in personal development, networking and training sessions. “I had a great time in Hobart and it was a good week all round meeting many people and learning new skills. “CDU training has taught me the importance of strong attention to detail, customer satisfaction and taking an immense pride in my work,” he said.